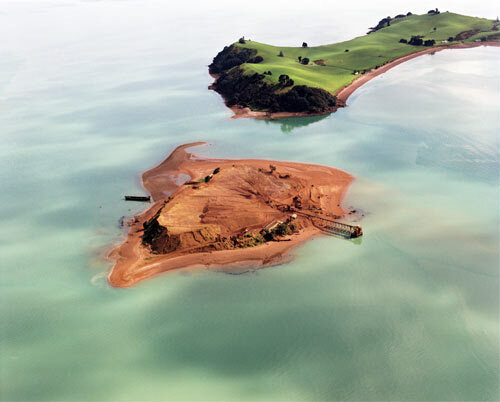 This aerial shot of the Hauraki Gulf includes Kāramuramu Island, where rock is quarried for aggregate chips. The reddish-brown mudstone is known as chert, or ‘McCallum chip’. It is popular as a decorative stone for paving slabs, sealing chips and exposed aggregate. Barges carry the quarried material to nearby Auckland. This quarry is a clear indication that some aggregate resources are finite, and that quarrying may have environmental effects. When the site is worked out the source will have been exhausted, and the island mostly removed.